From the M25 take the A41 (Junction 20) west towards Aylesbury. Proceed for approximately 8 miles and exit at the CHESHAM INTERCHANGE (A416). Turn LEFT at the next roundabout towards Berkhamsted Town Centre. 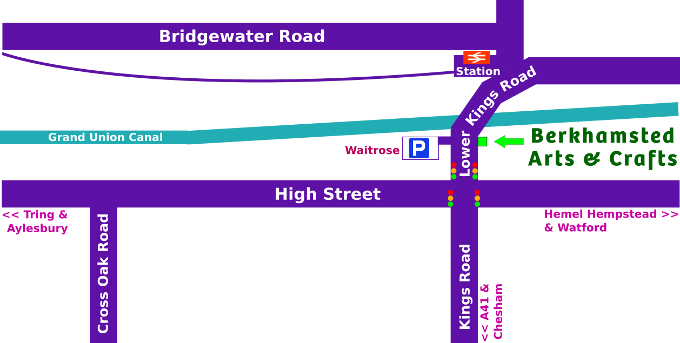 Follow this road (Kings Road) to the traffic lights (this includes a sharp right-hand bend). Get into the left-hand lane and go straight over the lights into Lower Kings Road. We are situated on the right-hand side after approximately 100 yards. The Pay & Display Car Park is directly opposite Berkhamsted Arts & Crafts.